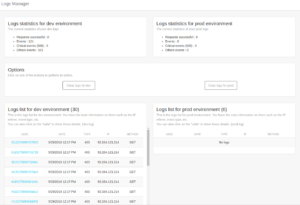 The first and second block show your the production environment statistics for logs events as the same as development statistics but for the production. The second part if you want to clear the logs files you just need to click on “Clear logs for dev/prod”. Finally the las part you have the logs list for development environment and the same but for the production.